The Audi A6 is a four-door, five passenger luxury sedan, and a four-door, 5 passenger luxury wagon. The 2009 Audi A6 is a carryover from 2008. The 2009 A6 is available in two different body styles, the standard sedan and a wagon variant called the Avant. The wagon only comes in a single trim, the 3.0T. The wagon’s drivetrain has been updated for 2009, with the Avant 3.0T now featuring a 3.0 liter supercharged V6 that produces 300 horsepower and 310 lb-ft of torque. A 6-speed automatic Tiptronic transmission is provided, along with all-wheel drive. Fuel economy for the 2009 A6 Avant 3.0T comes in at 18 miles per gallon in the city and 26 miles per gallon on the highway. The sedan features three different trim levels. The A6 3.2 makes use of a 3.2 liter V6 engine that generates 255 horsepower and 243 lb-ft of torque. A continuously-variable automatic transmission sends power to the front wheels, and fuel economy is rated at 18 miles per gallon in the city and 27 miles per gallon in highway driving. The next step up is the A6 3.0T, which uses the same drivetrain as the Avant 3.0T and offers identical fuel mileage. The top of the A6 line is the 4.2 trim, which shoehorns a 4.2 liter V8 engine between the sedan’s front fenders. This mill is good for 350 horsepower and 325 lb-ft of torque, and comes with all-wheel drive and a 6-speed automatic Tiptronic transmission. In the city, the A6 4.2’s fuel economy is reported as 16 miles per gallon, with 23 miles per gallon showing on the highway. The Audi A6 was introduced in 1994 as part of Audi’s re-structuring of their entire vehicle lineup. The A6 was re-designed in 2005 in order to enlarge the platform and apply some of Audi’s newer technological developments. 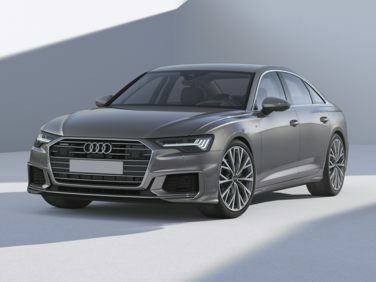 This mid-size sedan is in direct competition with the BMW 5-Series and the Mercedes E-Class, and with available V8 power and Quattro all-wheel drive, the A6 is a popular choice for luxury car buyers. The 2008 Audi A6 is available as either a sedan or a wagon (the Avant). The wagon is powered exclusively by a 3.2 liter V6 engine which produces 255 horsepower and 243 lb-ft of torque, while the sedan benefits from the choice of either the same V6 or a 350 horsepower, 4.2 liter V8 engine. The all-wheel drive Quattro version of the sedan or wagon is outfitted with a 6-speed automatic transmission which also offers manual Tiptronic shifting, while the front-wheel drive editions of the car (V6 only) come with a 7-speed automatic. Performance for the V8 is excellent and acceleration to 60 miles per hour takes only 5.8 seconds, while the V6 lags a full second behind. Fuel mileage for the front-wheel drive V6 is predictably much better than that of the Quattro V8 on the highway, showing 27 miles per gallon, and in town economy is almost the same at 18 versus 16 miles per gallon. Like all Audi’s, the A6 employs a drive by wire system which uses an electronically controlled throttle, and the top speed is limited to 130 miles per hour. The A6 interior is excellent no matter which engine option or trim level is ordered. Leather, wood trim and power windows, seats and door locks are standard features, and the list of basic equipment also includes dual-climate control, headlight washers, fog lights and 18-inch wheels. Buyers can choose to add memory seats, upgraded leather and a cold weather package. A technology package which includes a voice-controlled navigation and multimedia system is available, and of course the S line trim which stiffens suspension and adds a more sporty appearance inside and out can also be ordered. The A6 is a well-mannered, comfortable vehicle to drive, even on treacherous roads. A large part of this can be attributed to the vehicle’s weight and the Quattro all-wheel drive. Both the sedan and the wagon display good performance with the base V6 engine installed under the hood, although those with autobahn aspirations are better off ordering the V8. The 6-speed automatic performs its shifting duties with smoothness and prescience, and the vehicle never feels as though it is caught pondering which gear it should select next. The suspension is more than up to the task of handling this larger mid-size, and the available S-line package improves performance considerably, while at the expense of some ride comfort. The Audi A6 is a solid choice for anyone looking for a roomy, safe luxury sedan. While not as visually ostentatious as the BMW 5-Series, the A6 and A6 Avant provide drivers and passengers with everything that is to be expected from a high-quality German vehicle.